Chapterhouse Dune is a science fiction novel by Frank Herbert, last in his series of six Dune novels. 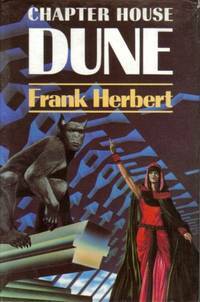 Published in 1985, it is also known variously as Chapterhouse: Dune, Chapter House Dune and Chapter House: Dune. Herbert died in 1986, leaving some overarching plotlines of the series unresolved in what has been described as an "über-cliffhanger. " Two decades later, Herbert's son Brian Herbert, along with Kevin J. Used - Good. Former Library book. Shows some signs of wear, and may have some markings on the inside. Putnam Adult, 1985-04-22. Hardcover. Good. 1986-01-01. New. Ships with Tracking Number! INTERNATIONAL WORLDWIDE Shipping available. Buy with confidence, excellent customer service! 1985-04-05. New. Ships with Tracking Number! INTERNATIONAL WORLDWIDE Shipping available. Buy with confidence, excellent customer service! 2009-09-08. Good. Ships with Tracking Number! INTERNATIONAL WORLDWIDE Shipping available. May not contain Access Codes or Supplements. May be ex-library. Shipping & Handling by region. Buy with confidence, excellent customer service! Putnam Publishing Group. Hardcover. 5550995689 New Condition. . New. Putnam Publishing Group. Hardcover. 5550995689 Like New Condition. . Fine. 1987-08-09. New. Ships with Tracking Number! INTERNATIONAL WORLDWIDE Shipping available. Buy with confidence, excellent customer service! 2012-05-07. New. Ships with Tracking Number! INTERNATIONAL WORLDWIDE Shipping available. Buy with confidence, excellent customer service! 1985-05-09. Good. Ships with Tracking Number! INTERNATIONAL WORLDWIDE Shipping available. May not contain Access Codes or Supplements. May be ex-library. Shipping & Handling by region. Buy with confidence, excellent customer service! London: Gollancz, 1985. First Edition 1st Printing. Hardcover. Fine/As New. True First Edition Of This Dune Novel, Published Prior To The American Edition. As New Except Paper Aged, As Usual With This Book. Fine Dj Art By Peter Goodfellow. Orion Publishing Co. Hardcover. 0575035765 New Condition. . New. Orion Publishing Co. Hardcover. 0575035765 Like New Condition. . Fine. Book. Hardcover. 1st Edition. 1985 first printing in fine tight and clean 464 page hardcover and very good plus jacket for those who want the best! better than any paperback!. LONDON: GOLLANCZ.. Near Fine. 1985. First Edition. 0575035765 . First edition. Precedes American edition. Near fine in fine dj. (Text age toned) . Orion Publishing Group. PAPERBACK. 057507518X New Condition. . New. Turtleback Books. SCHOOL & LIBRARY BINDING. 0808599623 New Condition. . New. 2012-05-07. Good. Ships with Tracking Number! INTERNATIONAL WORLDWIDE Shipping available. May not contain Access Codes or Supplements. May be ex-library. Shipping & Handling by region. Buy with confidence, excellent customer service! Putnam Pub Group (T), 1985-04-01. Hardcover. Used:Good. LONDON: VICTOR GOLLANCZ, 1985. 1ST EDITION. HARDCOVER. NEAR FINE/FINE. LONDON: VICTOR GOLLANCZ, 1985. 1ST EDITION. NEAR FINE/FINE. Victor Gollancz Ltd, London, 1985. Octavo, boards. First edition. Sixth Dune novel. A near fine copy in fine dust jacket. Umarked, not remaindered or library, mylar cover, unclipped jacket. 1987-08-09. Good. Ships with Tracking Number! INTERNATIONAL WORLDWIDE Shipping available. May not contain Access Codes or Supplements. May be ex-library. Shipping & Handling by region. Buy with confidence, excellent customer service! Book. Hardcover. 1st Edition. 1985 FIRST EDITION PRINTING HARDCOVER IN FINE CLEAN 464 PAGE HARDCOVER AND JACKET THAT LIGHTS UP ANY BOOKSHELF!. London England: Victor Gollacz, 2003. First Edition light sunnimg to dj spineThe sixth in the Dune sequence. The long-established galactic order is passing. The Honoured Matres, ruthless and all-conquering, have destroyed the planet Dune. In opposition, hard pressed but still fighting back, the Bene Gesserit sisterhood co-ordinate their resistance from their as yet undiscovered home world, Chapter House. (We carry a wide selection of titles in The Arts, Theology, History, Politics, Social and Physical Sciences. academic and scholarly books and Modern First Editions ,and all types of Academic Literature.). First Edition. Cloth. Near Fine/Very Good. 8vo - over 7¾" - 9¾" Tall Octavo. Hardback. Orion Publishing Group. PAPERBACK. 057507518X Like New Condition. . Fine. Turtleback Books. SCHOOL & LIBRARY BINDING. 0808599623 Like New Condition. . Fine. Turtleback, 1996-02-01. School & Library Binding. Used:Good. London, United Kingdom: New English Library, 1986. First Paperback Printing. Mass Market Paperback. Good. Brief summary of content available upon request by e-mail. 1st 1985. Victor Gollancz - London. 0575035765. Fine in Fine dustwrapper. .
New York: G. P. Putnam's Sons (1985), 1985. First printing. Hardcover. Very Good/Near Fine. 464 pp. Price of $17.95 on front flap of dust jacket. Very Good with slight concavity to the spine in a Near Fine dust jacket with a few scratches to the front panel. Turtleback Books. SCHOOL & LIBRARY BINDING. 0808599623 Special order direct from the distributor . New. 1985 First Edition. Tight spine. clean and bright dust jacket. Fading to pages. ACE. New. 6.88 x 4.18 cm. Findaway World, 2008. Audio Book. Good. preloaded_digital_audio_player. PLAYAWAY ** DIGITAL AUDIO PLAYAWAY EDITION ** withdrawn from the library collection. A PLAYAWAY is a Compact Digital Audio Player already pre-loaded with your audio book. PLAYAWAY IS EASY TO USE! Just plug in the earphones, press the power button ON and begin to listen and enjoy. Included is a NEW BATTERY and NEW EARBUDS. Light weight with a powerful purpose. Take along on your next journey. Makes a sensitive get well gift! Enjoy the convenience and versatility of the PLAYAWAY for all your travel and leisure needs..
Putnam Pub Group. Hardcover. 0399130276 American first edition, first printing. Published by Putnam in 1985. Contains numberline 1 2 3 4 5 6 7 8 9 10. Jacket is in Very Good + condition. Very minor wear to spine ends and edges of jacket. Top spine area of jacket has a small 1/4 inch tear. Jacket is neatly price clipped. Covers are clean and bright. Edges are sharp. No tears or creases. The book itself is in Near Fine condition. The binding is straight and tight. Remainder mark. All books are marked down 35% until February 1, 2019. Start stocking up now! . Very Good. 1985. First Edition. Gollancz, 1985. 1st UK edition. Hardcover. Fine in fine dj. 379pp. .
Turtleback Books. SCHOOL & LIBRARY BINDING. 0808599623 . New. Turtleback Books. SCHOOL & LIBRARY BINDING. 0808599623 signs of little wear on the cover. . Very Good. Turtleback Books. SCHOOL & LIBRARY BINDING. 0808599623 Minor shelf wear . Very Good. New York: Berkley, 1986. Softcover. Good. Later. Good in wrappers. Browning with some pen marks throughout. Cover rubbed with light wear along edges. Please Note: This book has been transferred to Between the Covers from another database and might not be described to our usual standards. Please inquire for more detailed condition information. New York: G.P. Putnam's Sons, April 1985. First edition. Hardcover. Good/good. First edition, complete number line with 8504 bottom inside front dj flap. Hardcover. Quarterbound brown cloth spine with gold lettering over beige boards. Brown endpapers. Top and fore edges have some age spotting and fading. Sticker ghost to front, moderate shelfwear and a very small (1/8") torn corner rear upper left. Original price of $17.95 on inside front flap. DJ protected with Brodart cover. 464 pp., 8vo., bookseller #0087. England: Gollancz, 1985. Book. Very Good. Hardcover. 1st Edition. 1st UK edition published prior to the US edition. Spine faded, couple of minute nicks to the back cover which break the colour, pages age toning. Tiny mark to corner of front free endpaper. Over 500 grams packed.